Situated within this cul de sac setting we are delighted to introduce to the market this superb three bedroom semi detached house which is well presented and has a garage and two car driveway to the front. Internally the accommodation briefly comprises; entrance lobby, lounge, stylish fitted kitchen and a double glazed conservatory. Upstairs there is a landing which opens into three bedrooms and a bathroom/wc with shower above the bath. 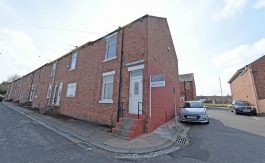 An enclosed garden is located to the rear and the property is located with great access to the Felling bypass, Newcastle City Centre and Sunderland. The house has double glazing installed to the windows and gas central heating With radiators. Viewing is strongly recommended at this sensible asking price. Entrance Lobby – Access to the home is via a double glazed door with a double glazed window to the side. There is an internal door which opens into the lounge. Lounge – 4.85 x 4.95 (15'10″ x 16'2″) – With a double glazed window which overlooks the front aspect, radiator and a spindle staircase leads to the first floor accommodation. The focal point of the room is the modern Adam style fireplace with hearth and recess with a fire fitted inset. Coving is fitted to the ceiling and an internal door opens into the kitchen. 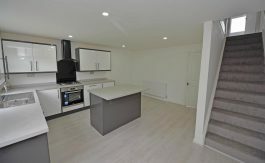 Kitchen – 4.85 x 2.26 (15'10″ x 7'4″) – The kitchen is fitted with a modern range of floor and wall units with working surfaces including a sink unit which is fitted with a mixer tap. Built in appliances include a gas hob with an extractor fan above and an electric oven is fitted below. There is tiled splash backs and a double glazed window overlooks the rear garden. There is plumbing and recessed are also provided for a dishwasher and a washing machine. A central heating boiler is encased behind a kitchen cupboard. There is a radiator and an opening leads into a conservatory/dining area. Conservatory / Dining Area – 3.08 x 2.60 (10'1″ x 8'6″) – A lovely double glazed room which has a set of double glazed French doors which opens into the rear garden. The is a radiator and laminate wood flooring. First Floor – With a landing which has internal doors which opens into the bathroom/wc and all three bedrooms. Bedroom One – 4.24 x 2.80 (13'10″ x 9'2″) – With a radiator and a double glazed window which overlooks the front aspect. Bedroom Two – 2.99 x 2.80 (9'9″ x 9'2″) – With a radiator and a double glazed window which overlooks the rear aspect. Bedroom Three – 2.96 x 1.95 (9'8″ x 6'4″) – With a radiator and a double glazed window which overlooks the front aspect. Bathroom/Wc – With a white three piece suite which briefly comprises low level wc, wash hand basin and a panelled bath which is fitted with a shower above. There is a radiator and a double glazed window. The walls are tiled. External – At the front of the home there is a low maintenance garden and a driveway for two cars. At the rear of the home there is a lawned garden with a patio area. Garage And Parking – Single garage with an up and over door.